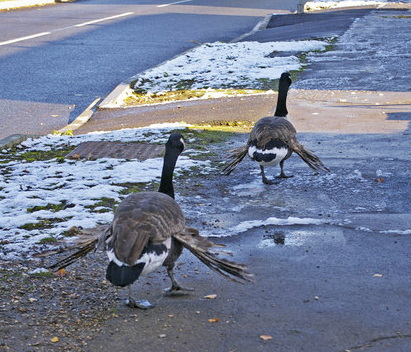 When you see it, you may think that the twisted wing on a goose or a duck is injured or broken. But it’s not broken, and it is not an injury; it is a deformity called “angel wing” and there is nothing angelic about it. A diet full of carbs when their feathers were developing has doomed these Canada geese to a life of flightlessness, difficulty in accessing food, and easy predation. Angel wing is a debilitating condition for waterfowl and is directly caused by human feeding. When young, growing birds are fed high carbohydrate foods such as bread and popcorn (which replace the important nutrients found in their natural food sources), their wing feathers grow faster than their bones can support, causing their wrists to twist outward and their feathers to protrude at odd angles. Because geese and ducks grow to adult size so quickly, just a few days of an improper diet can impact the proper development of their wings. Bird wings are the equivalent of the human arm, and angel wing affects the “wrist” portion of the wing, causing the “hand” to rotate and twist outward. It can affect one or both wings, making it impossible for the birds to fly. Although younger birds with angel wing can sometimes be rehabilitated, the condition is incurable in adult birds and renders them flightless. This leaves the birds vulnerable to predators and makes it more difficult for them to find food, causing them to become more reliant on handouts from humans. Resist the temptation and please, please, don’t feed the babies. Mom and dad will show them the right foods to eat. Most everyone likes to feed wildlife. For some it has even become a traditional way to have children experience close contact with animals. It gives us the warm-fuzzies thinking we are helping them, and it’s cool to get up-close and personal. But while we humans are saying no to high-carb diets, we don’t think twice about stopping for a loaf of bread on our way to the city pond or community lake to feed it to the geese and ducks, especially during baby season. But we are doing much more harm than good. 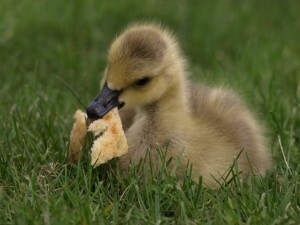 With each slice of bread you dole out to a gosling or duckling, you may be dooming them to an abbreviated life of flightlessness and agony. So does this mean you can’t feed the geese and ducks anymore? Not necessarily. In communities where it is not prohibited, there are nutritious choices for feeding them. Learn more about what those foods are and even more about angel wing by clicking here. While feeding even the right kind of food might not be prohibited, it is important to know that feeding wild animals can cause them to become reliant on humans for handouts which can lead to human-wildlife conflicts.